Shorebirds are king in spring along the Delaware Bay. Thousands of Red Knots (the vast bulk of the subspecies rufa) join with Ruddy Turnstones, Semipalmated Sandpipers, Sanderlings, Laughing Gulls, and many others to feast on the eggs of Horseshoe Crabs. The masses of foraging shorebirds jammed together on the beach create an unforgettable spectacle. Many colorful songbirds migrate through Cape May in spring on their way to more northerly breeding grounds, but the Prairie Warbler is one species that sticks around to breed here. The staccato, buzzy, rising song of this lovely warbler is one of the many bird sounds that will surround us in the open woodlands and scrubby fields at Land’s End. The varied metallic colors and intricate patterns of this male Wild Turkey are especially easy to see in spring. In recent years, we’ve had some amazing, close sightings of displaying gobblers along the streets of West Cape May and Cape May Point. Winding tidal creeks, bright green Spartina marsh, and rich mudflats form the backbone of the Cape May back bays. This vital landscape joins the mainland with the oceanic barrier islands. We explore this fascinating saltmarsh up close from a stable pontoon boat that allows us to approach Clapper Rails, Whimbrels, American Oystercatchers, and Yellow-crowned Night-Herons. 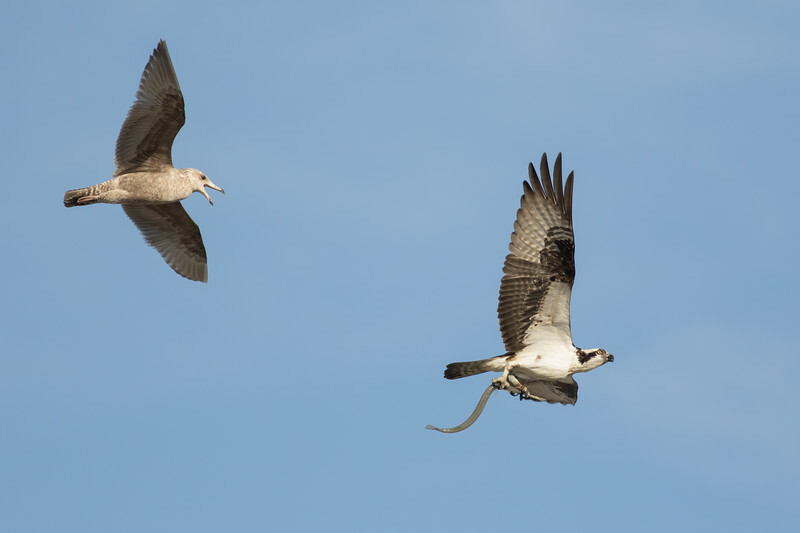 Ospreys find nirvana in Cape May due to the fish-rich waters surrounding the peninsula. This one is carrying an Atlantic Needlefish while being pursued by a hungry immature Herring Gull. Cape May hosts hundreds of these specialized raptors, and we’re sure to see many of them fishing and visiting their stick nests during our tour. In addition to being a popular seashore resort for humans, Cape May provides critical habitat for scores of migrating songbirds. This rare and secretive Bicknell’s Thrush spent a few days foraging in protected, insect-rich gardens and dunes in Cape May Point in May 2016. Cape May's stopover habitat was likely critical as this migrant prepared for the final leg of its spring journey from Hispaniola to the wild mountaintops of the northeastern US and Canada. Our 2018 tour group joined many local birders to watch an unexpected Magnificent Frigatebird as it hung in the wind over Cape May Point. Richard Crossley was the bird's finder, and after recovering from the shock of seeing a frigatebird in New Jersey, he sent out an RBA (Rare Bird Alert) text message. Word of a rarity travels fast in Cape May -- within minutes, other birders converged, and we all enjoyed this special visitor from the south. You can feel the excitement of this lucky mob by looking at the faces in this photo! On our tours here, we always enjoy becoming part of the storied community of Cape May birders; this group of locals includes many talented and friendly naturalists, field guide authors, tour leaders, and devoted conservationists. Even when it rains in Cape May, the birding can be quite good. In fact, rainy days on our past few spring tours have resulted in some wonderful sightings of boreal songbird migrants like this scarce Bay-breasted Warbler. Fortunately, just a short distance from our beach hotel, we can walk through the quiet streets of Cape May Point and search for migrants when the conditions are just right. During spring in Cape May, shorebirds can be incredibly numerous, and they often hide some surprises in their masses. This rare Curlew Sandpiper from Eurasia was mixed in with the thousands of Dunlin and Short-billed Dowitchers on our 2016 tour, and at times it was the closest bird to our group! You never know what you’ll see here – for example, in both May 2017 and 2018, a Swainson's Warbler appeared and sang lustily from the woods of Cape May Point. On last year’s tour, we enjoyed intimate scope views of this much-desired warbler as it held its adopted territory at the southern tip of New Jersey. In mid-May, Mississippi Kites regularly drift north out of the humid southeastern US and find themselves in Cape May. On warm days with good soaring conditions, we frequently enjoy excellent views of these graceful raptors as they hunt for dragonflies overhead. In recent years, sightings have increased, and this pioneering species has even been found nesting as far north as New Hampshire (!). Most of the birds that we see in Cape May in spring, however, are nonbreeders - subadults with banded tails and mottled plumage like this one from our 2017 tour.